I have started cycling since Jan, 2012. I have ridden over 1500km so far ever since I started cycling. Friends who haven’t seen me for a few months said that I look thinner than before. My skin looks better and my face looks younger. Also, I found that my dummy fat has reduced a lot as well. At a point, I had to wear 32″ waist size jeans,and I am now back on 30″. My weight has also gone from 72kg down to 68kg now. I think the best proof is the blood presuress reading. My blood presuress always sat at a boader level which classified between a normal high and high (128/89 – 131/92). After 6 months of riding, my blood presuress has dropped to a ideal/normal level (114/74). Want to get some health benifits from cycling? join our Causal Cycling Group on Facebook! Contact me for more details! According to this http://www.sydneymedia.com.au/html/5047-record-number-of-trips-on-sydneys-cycleways.asp, the number of people ride a bike to work is increasing! 1. It saves me $$$ on gym membership. I am actually doing exercise on the way to work and on my way home. 2. It saves me $$$ on car space, petrol and toll. 3. Even I have a car space in North Sydney, It is 15 minutes walking distance away from the office. Riding a bike to work, I can park in the basement and get to the office by a lift. No walking distance! With more and more cycleways built in Sydney, I am sure more and more people will ride to work. I think I am lucky that where I work provide shower facilities. Just before I picked up cycling again, I think I haven’t been cycling for over 12 years ever since I have moved to Sydney. I remembered when I was going to High School in Hong Kong, I used to go cycling nearly every weekend with my classmates. A group of 4 rent a bicycle at Tai Wai and then headed north to Sha Tin and sometimes even Fan Ling. Back in those days, we did that for fun. It is not for training or excerise, just a day out have fun with mates. Hong Kong off road cycleways were well established already back in that time, it was safe and no need to worry too much about cars. 1. I don’t have a bike and I don’t know where to rent one. 2. I didn’t realise there are off road bike path around. So ended up I didn’t have a chance to get back into cycling. 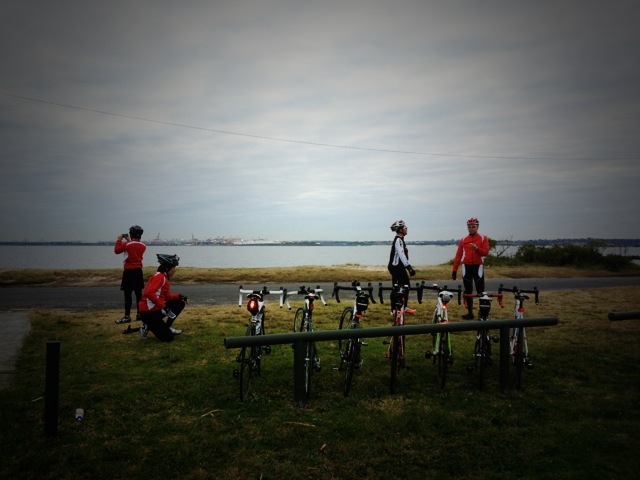 Until recently, a friend who moved into Ermington started cycling nearly every weekends. I was interested on cycling, so I asked him where is safe to ride, and he told me there is cycleway around right next to Parramatta River and Sydney Olypmic Park. The cycleway is just right next to his home! After knowing this, I went to buy my 1st bike in Australia and it was a Cannondale Quick 3 flat bar hybrid bike. I went with him do a few Laps in the cycleway (mixed with a short section of quiet street). And now I am addicted into cycling and I have upgrade my bike to a dropped bar roadie. Considered opening a new category, but I rather to put them under the same group transport. A car is to take me frm A to B, a bicycle is just the same (with no pollution at all).